My Favorite Illustrated Christmas Book Collection For Children! This is the best Christmas book collection in our library. If you guessed that I found this collection by chance - you are 100% right. It was a complete fluke and it happened six months ago. I was looking for unabridged and illustrated versions of children's classics and somehow my thoughts turned to ... yes, Charles Dickens. Hey, where are you going? It's not what you think. In fact, I haven't read a Charles Dickens book in more than two decades. Still, I knew it was high time to get in touch again with the great opus of the magnificent C.D.. 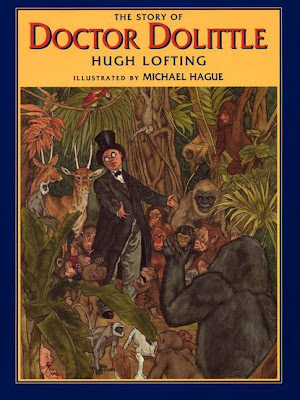 Yet, it crossed my mind - could I find a great unabridged and illustrated version of one of his classics? A read-aloud version that my twins could enjoy with me? Well, one thing led to another and all of a sudden I found myself staring down at the most wonderful Christmas read-aloud book set I ever saw. "Dad, is it fancy? ", my daughter would ask me now if she heard me. (She is still under the Fancy Nancy spell). "Dad, does it glitter? ", my son would probably add. ("Glitter" is one of his latest verbal conquests). Hush, don't tell my kids - but I am glad to report that my discovery is neither fancy nor does it glitter. 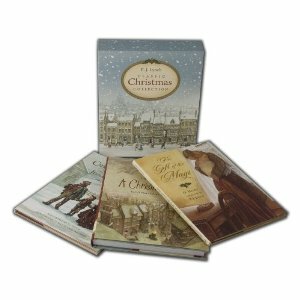 It is merely a stupendous collection of three classic Christmas books illustrated by the astounding P.J. Lynch. The Christmas Miracle of Jonathan Toomey (by Susan Wojciechowski). But it is not awards that matter. What matters is the heart and talent that stands behind them. Ohhhh ..... before I continue, did you know that I recently reviewed another fabulous Christmas Treasury gift box set. The Christmas edition of classic Donald Duck comics penned by the inimitable Carl Barks. An incredible present for any boy or girl and unrivaled read aloud material! Ah, lives of men! When prosperous they glitter - like a fair picture. Okay, where did we stop? We were on a search for more accessible (illustrated) versions of books penned by the greatest novelist of the Victorian period. And after viewing a Robert Igpen illustrated edition of A Christmas Carol, that I didn't like too much (I admit that Igpen is not one of my personal favorites) - I stumbled upon an low key cover of the same Dickens book. This one was illustrated by P.J. Lynch. Nothing ground-breaking, I thought just by looking at the Lynch cover that I saw online. And then I peeked inside. In a second, I realized that as much as I know and love the story of Ebeneezer Scrooge, I had never read the book! And I am not alone on this, thank Heavens! 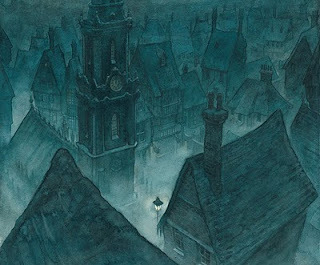 Many of us have heard, seen or listened to versions of Dickens' A Christmas Carol, but how many of us have actually read it (aloud)? Ohhh! And look at those images! This book is a time machine that doesn't just take you back to a Victorian era, but to a ghostly little Victorian era perfectly recreated by P.J. Lynch. 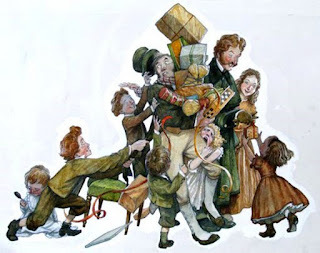 "I've been thinking of illustrating A Christmas Carol for many years. When I lived in Brighton, I used to walk daily past a gravestone belonging to a man called Ebeneezer Robbins, who died on Christmas Day, 1842. In my mind, I felt sure that this man must have in some way inspired Dickens to create Ebenezer Scrooge in 1843. And I knew that one day I would illustrate this extraordinary story." Lynch is one of the most aclaimed illustrators in children's book publishing today. A winner of many awards, including the Kate Greenway Medal (twice), the Mother Goose Award and the Irish Bisto award (twice). Looking back, he seems to be the perfect candidate to bring to life Charles Dickens' "ghostly little book", as the great Victorian novelist used to refer to A Christmas Carol. What's more A Christmas Carol - which became an instant hit after publication on December 17, 1843 - is also greatly responsible for popularizing the modern form of Christmas that many of us celebrate today. As Anita Silvey explains on her blog, with this small novel he revitalized the Christmas holiday—just with the power of his pen. 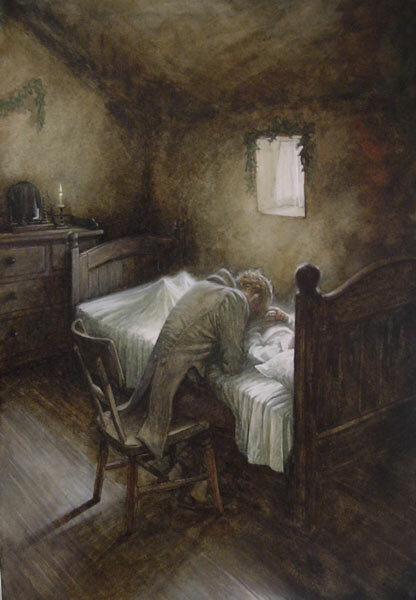 Dickens opens his story of heartless Ebenezer Scrooge on a bone-chilling Christmas Eve. He is paid a visit by three ghostly visitors, the troika of Christmas Past, Present and Yet to Come. Every one of his guests takes him on a heart-stopping trip during which he visits many compelling characters and his heart will have to change for the better if he is to avoid the dismal future that lays ahead of him. If Ebenezer Scrooge successfully transforms himself, his miraculous evolution could become a veritable Christmas joy. I was in love with Dickens all over again. And I found a preciously illustrated version of A Christmas Carol. What else could I ask for? Well, my quest ended in even greater joy when fate uncovered something that captured the true essence of Christmas - in an equally beautiful package. I discovered the three-book Classic Christmas Collection illustrated by P.J. Lynch, which includes two more adorable books that brought me to tears. A wonderful three volume slipcase, lavishly packaged and produced. Yes, the collection also features The Gift of the Magi (by O.Henry) and The Christmas Miracle of Jonathan Toomey (by Susan Wojciechowski). And I cried while reading the two books. The Christmas Miracle of Jonathan Toomey is a story about a village woodcarver named Jonathan Toomey - an unhappy, recluse man with a broken heart. Village kids called him Mr Gloomy. as if carrying a great weight on his shoulders. his wife and baby had become very sick. his wife and baby died, three days apart from each other. So Jonathan Toomey had packed his belongings into a wagon and traveled till his tears stopped. He settled into a tiny house at the edge of a village to do his woodcarving. One day, in early winter, a widow with her son Thomas knock on the woodcutter's door to ask him to recreate a very special set of wooden Christmas figurines that were lost. The chance encounter changes the life of all three forever, while the great frozen heart of Jonathan Toomey is melted by the innocent charm of the widow's lonely son and the boy's caring mother. That is just the bare bones. Without reading it, you will not feel it. This is a story for the heart, for the eyes, for the soul. For the first time, I say forget literacy. Warm your heart with a book. Fall in love with the book. You don't have to take my word. 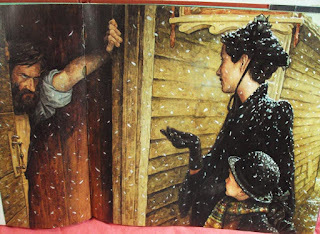 It had to have been many years ago -- before middle school, certainly -- my mother read us a picture book called The Christmas Miracle of Jonathan Toomey. It's very short, probably only a couple dozen pages, including illustrations, but it never fails to knock me out. 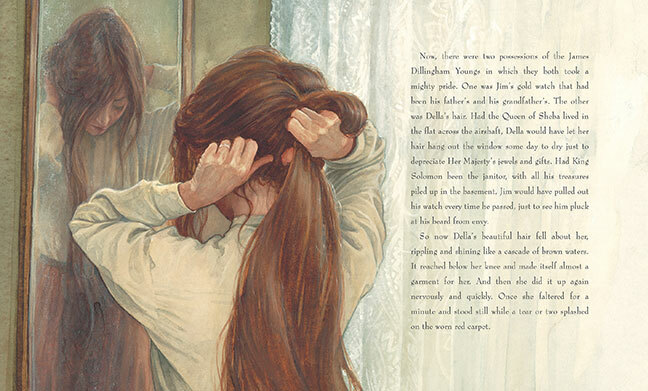 Susan Wojciechowski and illustrator PJ Lynch pack so much subtlety, beauty, hurt and hope on every page, he who comes out dry-eyed is missing a piece of their heart. Truly. 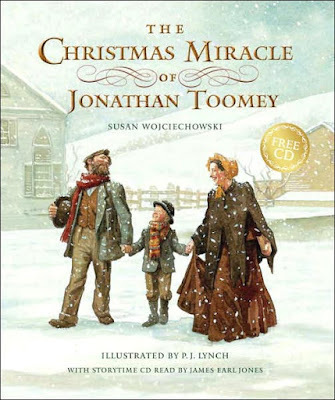 At the end of the book, you will find two incredibly moving personal accounts about The Christmas Miracle of Jonathan Toomey, from author Susan Wojciechowski and illustrator P.J. Lynch. Their reminiscences of how this beautiful book was created are simply the icing on a perfect cake. Make sure you don't skip their contributions, which are as gripping as the book itself. Two amazing books in a three-book classic Christmas collection. Yep - three amazing, quintessential Christmas stories! Just look at Lynch's cover page of the third book - The Gift of the Magi. It works wonders a single glance, it pulls your heart strings. Yes - this is an incredible story about the true gifts of Christmas. Author O. Henry (real name William Sydney Portner, 1862-1910) wrote this heart-wrenching tale of true love in which a husband and a wife on the verge of poverty secretly make great financial sacrifices in order to buy a meaningful Christmas present to each other. She has to sell her most treasured posession, he has to sell his. The plot twists and irony in O. Henry's story culminates in the moment when they both discover the incredible sacrifices they made. He sells his treasured golden watch (a family heirloom) to buy her a set of pure tortoise shell combs that she admired in a Broadway window. She sells her long beautiful hair to buy him a dandy platinum fob chain for The Watch. When they exchange the gifts, they fill with despair. This is a story about pure love that is easier found in a measly apartment, than in a flashy department store. P.J. 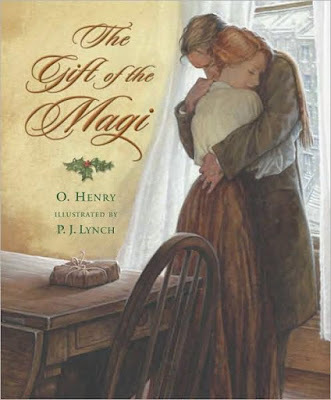 Lynch's heart-warming art in The Gift of the Magi speaks as loudly as O. Henry's words and the true message of the holiday season is firmly established with this third fabulous book from the collection. I was as happy as a puppy when I found this collection in June. Not because I want to give it as a present. No, no - presents are not enough with a beauty such as this. I want to read it aloud for Christmas - and that is why I am so excited. Just looking at these books is a humbling experience. Take a step back, sit down with your kids and glance together at what really matters in life. Wow. You found some gems! Thanks for sharing! I will link to your post for an Xmas post I am doing ... if you don't mind. I'll credit you, of course. It is a pleasure, a true pleasure PragmaticMom! You said it best. These are true gems. I love all of these Christmas stories. Perfect choice! These have such amazing illustration! Indeed these illustrations simply floor the reader. When I started reading aloud, I learned to appreciate illustrators. Giving a child a standard version of the book or the best illustrated version, is a completely different experience. It is mind-blowing to read these beautifully illustrated stories! Thanks so much for your comment Cathy! They are beautiful books indeed to end a year, to enter a new year and to start a holiday read-aloud tradition in any family! I'm a long time Lynch fan. Jonathan Toomey--and all the rest--are flat out amazing. Thanks! You have a great taste in books! Lynch's illustrated books are precisely that - "flat out amazing"! So happy to hear that you enjoy them as well. Oooh, I can't wait to read them to my twins now. What an amazing list! I'm adding these to our reading list. So glad you liked them. I'm sure you will love them when you read them. Amazing visuals, emotional stories. In one word: Perfect! Please let us know did you enjoy them - after you read them one day.